Justice League heads deeper into the mega-arc/pseudo-event known as “The Darkseid War”! Geoff Johns has shown a lot of the skill that displays why he is such a fan favorite writer. Jason Fabok is an artist that DC Comics readers haven’t really paid much mind to, but he has come out swinging with his Justice League work. Let’s delve right into Justice League #42. I am an immense Fourth World fan, and I am also extraordinarily picky about how the mythos plays into the general DC Universe. Preferably, the Fourth World would have no direct relation or intersection with the main universe. They have their own mythos that is large and wealthy enough to really do anything with. Yet, sometimes there comes along a story arc that gives me pause and shows me that it’s not so bad. Final Crisis was one. 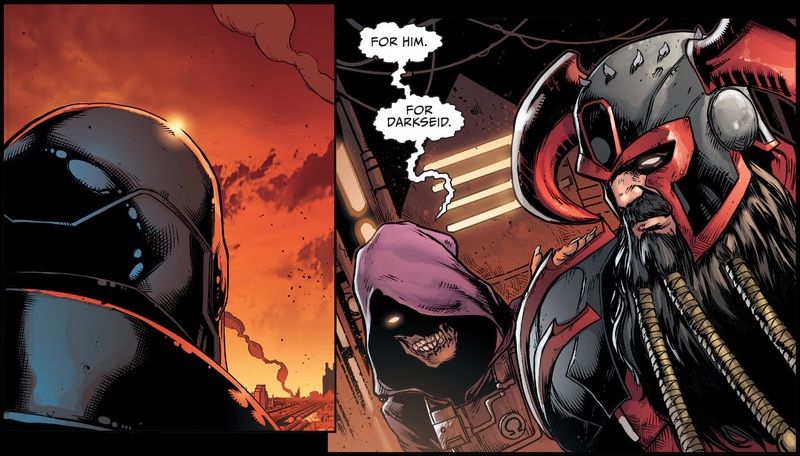 “The Darkseid War” is another. Sure there are some things I still do not like and doubt I ever will. Shifting the Anti-Monitor to a directly “New Gods” lens is a mistake and just really forced. There’s a moment with Metron here that I believe betrays his iconic stoic nature as well. Those matter less, though, in cases when the tone and grandiosity is done with the correct stature and gravity. Then you can say that a writer has done their homework and, while changing stuff, understands the roots. With some great moments by Darkseid, when you see exactly where his intimidation and menace comes from, and Mister Miracle - there is a lot that a Fourth World fan can sink their teeth into. So, even though I have misgivings, I am satisfied. When it comes to the other parts of the issue - there’s really only one thing to say: Wonder Woman steals the show. Much in the Johns fashion - she takes the lead and is made amazing with it. Fabok is no slouch, and fully deserves the space that I set aside to talk mainly about the art. It’s like a mix of Bryan Hitch with the playful cartoonishness of Ivan Reis. A more solid take on the David Finch model. He is able to make even the most standardly paneled pages come across like a blockbuster comic. He’s also one of the artists that has been able to make the New 52 Darkseid design in any way - and that’s not faint praise. Overall, while the story might not be proceeding at quickened rate, there’s still enough being set down to just be satisfied with. Also, it seems like this arc will continue into a second one, so there’s enough time to really bring everything home. Johns has really come a long way with regards to his Justice League in the past two years. Hopefully “The Darkseid War” will keep the momentum rolling when it comes to this. Comments and thoughts would be appreciated below.